As Americans learn more about the health benefits of vegetarian eating patterns, many are choosing to eat less red meat, poultry, seafood, and fish in favor of plant-based foods. Due to the growing trend in vegetarian eating, many clients and patients are asking dietitians how to incorporate more plant foods in their diets and tough questions about the nutritional aspects of eating a vegetarian meal pattern. 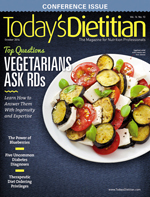 In this article, Today’s Dietitian provides evidence-based answers to some of the most common questions clients and patients ask nutrition professionals about a vegetarian eating pattern and what foods they should eat for optimal health. Q: I heard there are different types of vegetarians. Can you explain the differences? A: Vegetarians who consume plant-based foods as well as dairy products are called lacto-vegetarians. Those who include eggs, but not dairy, are called ovo-vegetarians, and individuals who consume both dairy and eggs are called lacto-ovo vegetarians. Vegans eat only plant-based foods and exclude all meat, poultry, fish, dairy, and eggs. Q: What foods should I eat to get the protein I need, and how much is required? A: This is a common question that clients and patients ask dietitians, since many no longer eat red meat, poultry, seafood, and fish, or do so sparingly. Protein is the building block of lean body mass and is essential for repairing damaged cells. It transports other nutrients throughout the circulatory system and serves as an energy source when carbohydrate intake is low. According to the 2010 Dietary Guidelines for Americans, 10% to 30% of daily calories should come from protein. The Recommended Dietary Allowance (RDA) for protein for all persons is 0.8 g/kg of body weight. Based on this recommendation, a 150-lb adult who eats red meat, poultry, seafood, or fish can meet his or her protein needs by eating 54 g of protein/day, about 11% of 2,000 kcal/day. Research has shown, however, that because the protein digestibility scores (the preferred method for measuring the protein value in human nutrition) for vegetarians is only about 90% and 76% for vegans because they don’t eat dairy and eggs, they should aim for a 20% increase in protein intake or 1.0 g/kg of body weight per day.2 A 150-lb adult who eats a vegetarian diet should consume 68 g of protein/day, about 14% of 2,000 kcal/day. By comparison, the DASH diet allows individuals to eat small amounts of flesh foods to meet a daily protein intake of 18% (nearly 80 g) based on 2,000 kcal/day. It’s easier for clients to reach their protein goals if they eat beef, fowl, and fish but they can get the same quality protein from eating a variety of legumes, grains, vegetables, fruits, nuts, nut butters, and seeds.3 The best vegan source of protein based on protein grams per calorie is soyfood, such as edamame (soybeans), tofu, and tempeh—which is tofu combined with grains. Soymilk’s protein content is comparable to cow’s milk. Seitan (wheat gluten) adapts as easily as tofu and tempeh in recipes, as it takes on the flavor of the herbs and seasonings added during cooking. In addition, beans, peas, lentils, nuts, seeds, and even whole grains are good protein sources for vegans. Q: How can legumes fit into a plant-based diet? Often, people avoid eating legumes because they cause gas and bloating. Mark Rifkin, MS, RD, LDN, owner of a private nutrition practice in Baltimore and a VN DPG member, offers suggestions to clients to reduce gastrointestinal (GI) distress. “The liquid in soaked or canned beans is the culprit of intestinal gas,” Rifkin says. “Always soak dried beans for eight to 10 hours and rinse them before cooking. Also, rinse canned beans before using.” He also recommends clients increase bean consumption slowly. First, they should begin eating lentils or split peas, then try black and pinto beans, chickpeas, and black-eyed peas. Q: I heard vegetarians have to combine certain plant proteins to achieve optimal health. Can you explain what this means? A: In the 1970s, vegetarians believed that combining various plant-based protein sources in the same meal, referred to as “complementary proteins,” would ensure they received complete proteins their bodies could use effectively. For example, grains such as farro, quinoa, and wheat berries contain high-protein levels but have limited amounts of the essential amino acid lysine. Essential amino acids are protein molecules our bodies can’t manufacture on their own so we must get them from food. While eggs and dairy are “complete” protein sources, providing good balances in all essential amino acids, many plant-based foods may fall short in one or two. Legumes are rich in lysine but poor in methionine, so the notion of combining foods that contain high levels of protein and essential amino acids such as beans and rice, tortillas and beans, and dal and rice was born. Today, we know that if you eat a plant-based diet it isn’t necessary to combine plant foods at one meal in order to “complement protein” as long as clients meet their calorie and protein needs by eating a variety of plant and protein-rich foods such as pinto beans, black-eyed peas, quinoa, and whole grains. To ensure patients get enough protein, recommend they limit processed and packaged foods, such as salty and sweet snacks, and refined cereals and crackers, and make room for whole foods, including soy protein, legumes, grains, nuts, seeds, and vegetables. Q: Are prepackaged vegetarian foods good for me? A: It used to be that meat analogs and nondairy milks and cheeses were sold only in specialty food stores. Now, most supermarkets sell several varieties of veggie burgers, soy bacon, soy nuggets and crumbles, and vegetarian hot dogs. These foods are convenient because they require little cooking time, but it’s always best for clients to choose whole, minimally processed plant-based foods, which are naturally low in saturated fat, sugar, and sodium. Suggest they choose healthier options such as tofu, tempeh, textured vegetable protein, and seitan, and save the faux meats and processed treats for only special occasions. Q: Is a vegetarian diet really healthier than a nonvegetarian diet? Q: I eat meat occasionally. Can I call myself a vegetarian? A: A vegetarian is an individual who consumes plant-based foods such as grains, legumes, nuts, seeds, vegetables, and fruit, and excludes beef, chicken, turkey, fish, and other flesh foods. Their diets may include dairy products and eggs. A semi-vegetarian enjoys a plant-based dietary pattern but eats beef, pork, poultry, or fish occasionally, such as once or twice per week. Many clients and patients label themselves as vegetarian even though they occasionally eat meat and fish, so it’s important for dietitians to understand their diet history to counsel them appropriately. A: Vegetarians can meet most of their micronutrient needs on a plant-based diet. However, plant-based eaters, especially vegans, can fall short on food sources of vitamin B12, vitamin D, iron, and calcium. Vitamin D deficiency among vegetarians also is a concern since they don’t eat salmon, mackerel, or other types of oily cold-water fish, which are considered good sources. (Lacto-ovo vegetarians can get vitamin D through fortified milk and eggs.) Vegans are at risk of deficiency because they avoid fish, eggs, and dairy products (fortified with vitamin D). Their only alternatives are to consume vitamin D–fortified orange juice and breakfast cereals, mushrooms with vitamin D, and take a vitamin D supplement. “As very few foods are fortified, it’s challenging for vegetarians to obtain adequate amounts through the diet. A vegan supplement is recommended if dietary intake is inadequate,” Pawlak says. However, both vegetarians and vegans can boost their vitamin D intake by getting at least 15 minutes of sunlight exposure daily, which produces vitamin D in the skin. And since vegetarians and vegans avoid red meat, poultry, and shellfish, they run the risk of not consuming or absorbing adequate iron. Plant foods contain nonheme iron, which is less absorbed than heme iron found in animal protein. To ensure clients meet daily requirements, suggest they use a cast-iron skillet for cooking to boost iron content, and combine vitamin C–rich foods, such as broccoli, Brussels sprouts, collard greens, kale, and citrus fruits, with iron-rich sources, such as beans, tomatoes, baked potatoes, soybeans, and pumpkin seeds, for better absorption. Recommend clients increase iron intake by using black strap molasses in baking, adding raisins to iron-fortified cereals with soymilk, and increasing their intake of beans and lentils. Warn clients that they shouldn’t take iron supplements that have more than 100% of the RDA unless a physician is supervising them. Calcium deficiency also is a concern. Lacto-vegetarians can consume milk, yogurt, and cheese, while vegans should choose calcium-fortified tofu, soymilk, tempeh, as well as legumes, green leafy vegetables, almonds, sesame seeds, and black strap molasses to meet daily requirements. If they aren’t eating these foods regularly, dietitians should recommend a calcium supplement taken in divided doses to fill in the gap. Q: I became a vegetarian to lose weight. Why hasn’t this worked? Therefore, vegetarian or vegan clients who haven’t lost weight or achieved a healthy weight may not be eating the fruits, vegetables, whole grains, and legumes that comprise a low-calorie, high-fiber, nutrient-dense diet. Instead of consuming appropriate portions of whole foods, minimally processed beans, grains, and healthful fats, they may be eating large portions of highly processed, refined vegetarian foods such as pastries and desserts, full-fat dairy products, and too many alcoholic beverages. It’s also possible that they may be consuming more than their energy requirement of calorically dense foods such as grains, legumes, nuts, seeds, and dried fruits. To determine why vegetarian clients aren’t achieving a healthy weight, dietitians should evaluate their current dietary intake patterns to determine energy consumption, help them plan a beneficial eating pattern that meets their needs, counsel them on the importance of portion control, and demonstrate what adequate portion sizes look like on a plate. Q: My teenage daughter has become a vegetarian. Doesn’t she need meat for proper growth and development? A: Teenagers don’t need meat for proper growth and development. “Although data on the growth of vegetarian teens is limited, most suggest there’s little difference between vegetarians and omnivores,” says Christine Bou Sleiman, program director for the Lawndale Elementary School district’s wellness program in Lawndale, California, and a VN DPG member. However, because they’re approaching adulthood, they will need to consume eight to 10 servings of whole grains; four or more servings of fruits and vegetables; six or more servings of legumes, nuts, seeds, and various plant milks; and four to five servings of healthful fats found in nuts, seeds, and avocados so they can reach recommended intakes for calories, protein, iron, zinc, calcium, vitamin D, and vitamin B12, according to RD resources from the VN DPG. “Nutrient-dense foods provide the biggest bang for your buck with all vegetarians,” Bou Sleiman says. Dietitians also should evaluate adequate intake levels of nutrients of concern, such as vitamin B12, vitamin D, calcium, and iron. Q: I have food sensitivities. Can I still follow a vegetarian eating pattern? A: Yes, clients and patients who have food sensitivities or intolerances can eat a vegetarian or vegan meal pattern with guidance from a dietitian. Clients with lactose intolerance experience GI disturbances, such as flatulence, abdominal pain, bloating, and diarrhea, following intake of an amount of lactose that’s greater than their body’s ability to digest it. Patients with lactose maldigestion experience a decline in the activity of the enzyme lactase that facilitates the digestion of dairy. Dietitians can tell vegetarian clients that even though they have lactose intolerance or lactose maldigestion, they can still enjoy dairy products in small amounts at meals or purchase lactose-free options in the grocery store. To date, there are many nondairy plant milks, yogurts, and cheese alternatives available in stores for lactose-intolerant vegetarians and vegans. However, some of these specialty dairy foods aren’t the best options due to their extra sugar and fat content. Guide clients on reading the labels to find the best products for them. Individuals who have nonceliac gluten sensitivity can’t digest the protein gluten found in wheat products and therefore may experience gas, bloating, diarrhea, and other GI symptoms. The good news is that there are many gluten-free products on the market, such as gluten-free breads, muffins, pastas, cereals, snacks, and desserts. And there are several resources dietitians can share with clients to help them adopt a healthful gluten-free vegetarian or vegan diet. Clients with irritable bowel syndrome (IBS) experience abdominal pain, bloating, cramping, diarrhea, and constipation caused by a sensitivity to a high-FODMAP (fermentable oligo-, di-, monosaccharides, and polyols) diet that contains short-chain carbohydrates (eg, lactose, fructose, fructans, polyols, and galactans/galacto-oligosaccharides) found in certain fruits, vegetables, grains, milk products, dried peas and beans, corn syrup, high-fructose corn syrup, and sugar alcohols found in nonnutritive sweeteners.10 To treat IBS symptoms, many dietitians are recommending clients consume a low-FODMAP diet or a patient-targeted elimination diet. The low-FODMAP elimination diet is based on limiting short-chain carbohydrate-containing foods clients can’t fully digest and absorb, and dietitians are in the best position to develop meal plans they can follow for optimal health. Q: What steps can I take to become a vegetarian? A: Clients and dietitians alike can download The Vegetarian Starter Kit (a 16-page publication from the Physicians Committee for Responsible Medicine) that provides step-by-step instructions on how to begin a vegetarian diet. Those interested in becoming vegan can read The Vegan Starter Kit at http://www.vegankit.com to begin the process. In addition, other evidence-based resources are available (see Resources sidebar). Once they learn how to begin a vegetarian and vegan eating pattern, they’ll quickly understand that there’s much more to it than simply removing meat and all animal products from their diets. Clients can start by identifying meatless meals they already enjoy such as bean burritos, grilled cheese sandwiches and tomato soup, vegetable pizza, and recipes that can be turned into plant-based meals, such as vegetarian chili, tofu stir-fries, and veggie burgers instead of beef hamburgers. In today’s market, consumers have many foods and meal ideas from which to choose to begin a healthful vegetarian and vegan lifestyle. RDs are the best resources for clients who are curious about these plant-based eating patterns. A well-planned vegetarian diet that includes a variety of colorful plant foods can meet all nutrient needs for children, teens, adults, and elders. Vegans should receive vitamin B12 supplementation, and vegetarians should be evaluated for B12 deficiency and depletion. In addition, vegetarians and vegans should get tested for vitamin D deficiency and take a daily supplement if serum levels are low. With all the research available, dietitians can feel confident as they counsel clients and patients who desire a more healthful lifestyle that can ultimately help prevent and treat chronic disease. — Diana Cullum-Dugan, RDN, LDN, RYT, is a freelance writer in private practice in the Boston area. She’s coauthor of the Academy’s Vegetarian Nutrition Toolkit, coordinator of Vegetarian Nutrition RD Resources, and a yoga therapist. 1. Stahler, C. How often do Americans eat vegetarian meals? And how many adults in the U.S. are vegetarian? The Vegetarian Resource Group website. http://www.vrg.org/journal/vj2011issue4/vj2011issue4poll.php. Accessed October 10, 2013. 2. Venti CA, Johnston CS. Modified food guide pyramid for lactovegetarians and vegans. J Nutr. 2002;132(5):1050-1054. 3. Dietary reference intakes for energy, carbohydrate, fiber, fat, fatty acids, cholesterol, protein, and amino acids. Institute of Medicine website. http://www.iom.edu/Reports/2002/Dietary−Reference−Intakes−for−Energy−Carbohydrate−Fiber−Fat−Fatty−Acids−Cholesterol−Protein−and−Amino−Acids.aspx. Accessed October 10, 2013. 4. Soret S, Mejia A, Batech M, Jaceldo-Siegl K, Harwatt H, Sabate J. Climate change mitigation and health effects of varied dietary patterns in real-life settings throughout North America. Am J Clin Nutr. 2014;100(Suppl 1):490S-495S. 5. Orlich MJ, Singh PN, Sabate J, et al. Vegetarian dietary patterns and mortality in Adventist Health Study 2. JAMA Intern Med. 2013;173(13):1230-1238. 6. Craig WJ, Mangels AR. Position of the American Dietetic Association on Vegetarian Diets. J Am Diet Assoc. 2009;109(7):1266-1282. 7. Pawlak R, Parrott SJ, Raj S, Cullum-Dugan D, Lucus D. How prevalent is vitamin B12 deficiency among vegetarians? Nutr Rev. 2013;71(2):110-117. 9. Tuso, PJ, Ismail MH, Ha BP, Bartolotto C. Nutrition update for physicians: plant-based diets. Perm J. 2013;17(2):61-66. 10. Catsos P. IBS-Free at Last! A Revolutionary, New Step-by-Step Method for Those Who Have Tried Everything. Control IBS Symptoms by Limiting FODMAPS Carbohydrates in Your Diet. Portland, ME: Pond Cove Press; 2009:19-20. • Craig WJ, Mangels AR. Position of the American Dietetic Association: vegetarian diets. J Am Diet Assoc. 2009;109(7):1266-1282.